Officer Jeff Atherly was one of two members of the Topeka Police Department killed on duty Sunday. TOPEKA—Two Topeka police officers were killed in a shooting just after 6 p.m. Sunday in Topeka. Cpl. David Gogian, 50, and Officer Jeff Atherly, 29, of the Topeka Police Department were killed in the line of duty while responding to a suspicious vehicle at 12th and Huntoon. 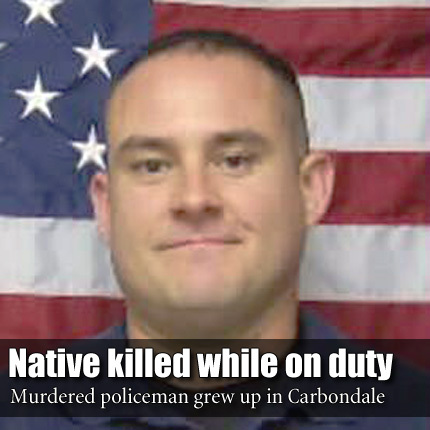 Atherly attended Carbondale schools from first through eighth grade and was a 2002 graduate of Santa Fe Trail High School. According to The Topeka Capital-Journal, Atherly served as a corrections officer from 2006 to 2011. He was hired by the Topeka Police Department on April 4, 2011. The suspected shooter, David Edward Tiscareno, 22, Topeka, was killed following a standoff and exchange of fire between Tiscareno and the Kansas Bureau of Investigation around 9 p.m. Sunday at 304 S.W. Western. Services for Gogian will be 10 a.m. Saturday; Atherly’s service will be at 2 p.m., both at the Kansas Expocenter. Atherly’s survivors include his fiancee, Sharity Kranz, son Logan Lane-Glenn Atherly, stepson Eric Gerhardt, and mother, Susan J. Bernhardt, all of Topeka; father Steven G. and special mother Joni Atherly, of Berryton; grandfather Morris Imthurn, of Topeka; and grandmother Mary Lou Atherly, of Topeka. Donations in memory of Gogian and Atherly may be made at Topeka Police Credit Union, 320 S. Kansas Ave., Topeka, KS 66603.